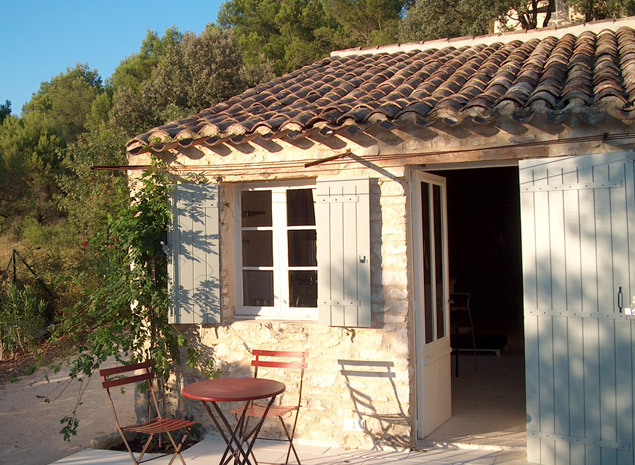 Main Floor, two bedrooms with private luxury baths open onto shaded terrace, single or double occupancy, petit dejeuner–French breakfast included. One queen bed ( 72″x79″) or two singles (36″x79″) are available. 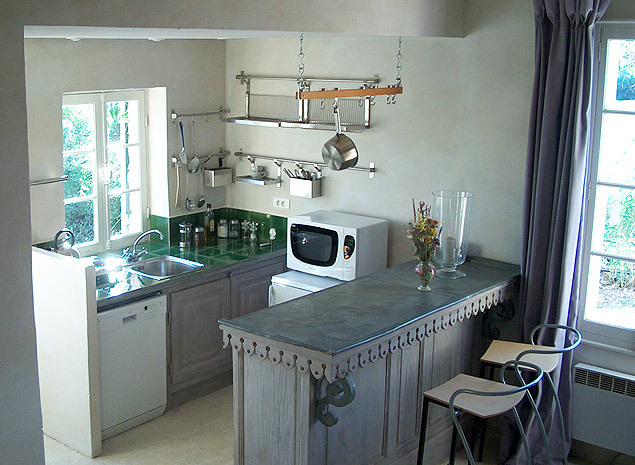 Second Floor, two bedrooms with private luxury baths open onto shaded veranda with beautiful views of Rhone Valley, single or double occupancy, petit dejeuner–French breakfast included. One queen bed ( 72″x79″) or two singles (36″x79″) are available. 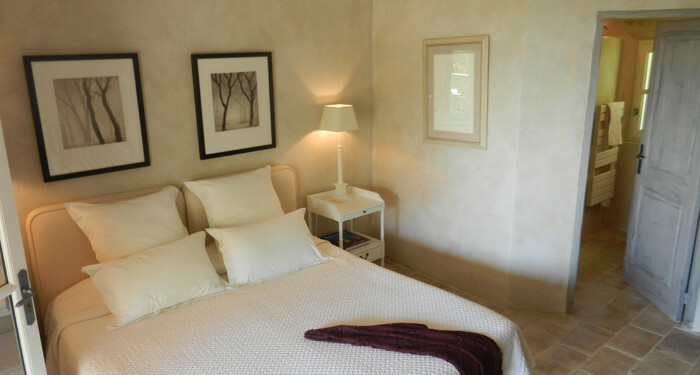 The Guest House, in its’ entirety, may be reserved and will accommodate 10 adults plus 2 small children. Please see our On Site Amenities below for additional information and details. 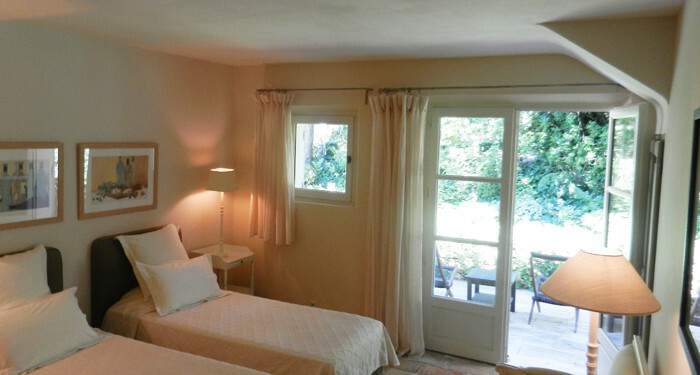 Spacious living/sleeping area, kitchenette, bath and private terrasse with small table for casual dining. Petit dejeuner— french breakfast included. Accommodates 2 adults and 2 small children. 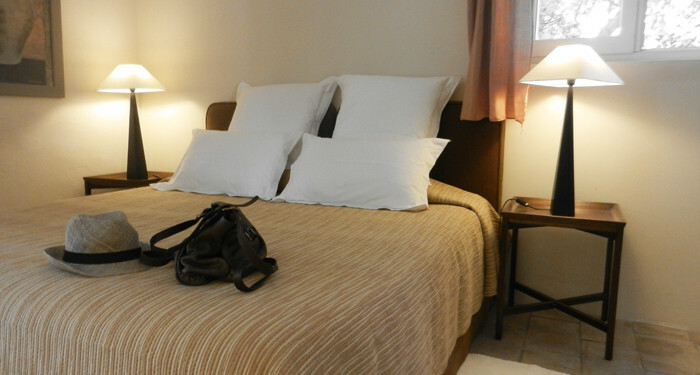 cost = 260 Euros per night OR 1650 per week (7 nights). For a more detailed description of all amenities see On Site Amenities below. A 50% deposit is due at time of reservation with the remaining balance due 30 days (when applicable) prior to arrival. If you are making a reservation from the U.S., a conversion from Euros into dollars will be provided at time of reservation along with detailed instructions as to how to make the deposit. Checks for payment in Euros will be accepted for reservations from European Union countries. I regret that I cannot offer credit card access; most French businesses similar in size to this one are in the same situation and thus direct deposits or wire transfers are required. In the event that Le Lavandin should cancel any reservation or workshop, all moneys paid shall be returned. In this time of increased unpredictability your host strongly recommends travel insurance to protect against loss of fees due to cancellations. Please consult your travel agent or insurance agent. We include several services and can recommend some wonderful additional services offered by experts in the area.